Please check back closer to the show for 2019 updates! For assistance on show-site: Show management is located in the Show Office in the Jim Graham Building near the exterior doors that face the Expo Center (look for signs). The Southern Exposition Services Desk (carpet rentals, forklift service, freight deliveries, etc) is located in the hallway outside of the Show Office in the Graham Building. For assistance with power, water, or hardline internet, please visit the Show Office and we will contact fairgrounds maintenance on your behalf. 3. Review Move-In and Move-Out information with your staff. Order your booth carpet, chairs, tables, and more! Pre-order discount deadline is August 30th! 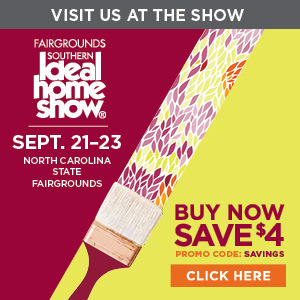 Basic electrical service is complimentary with your booth space; however, you must order at least two weeks prior to show in order for it to be activated. Email erinc@mpeshows.com with your booth number, company name, and whether you need basic or advanced electrical (will confirm receipt). Place your order by September 7th! Email ErinC@mpeshows.com if you plan to sample or sell any kind of food or beverage no later than 30 days prior to the show for review, approval, and sampling guidelines. Please click here for instructions to submit your Exhibitor Listing, highlighting your company's presence in the show for our attendees both before and after the show. All exhibits must be completely cleared from the show floor no later than 3:00pm.